I first met Sinclair Hood in 2006 during the 10th Cretological Congress in Chania. For me, it was a very emotional and formative moment to have the opportunity to talk to such an important and famous archaeologist, almost a “hero” of Minoan archaeology. Until then I knew him only through his vast number of publications, many of which we used to read during our university studies, such as The Home of the Heroes (London 1967) and The Arts in Prehistoric Greece (London 1978). I met him once again, as well as his kind and hospitable wife Rachel, several years later during my PhD studies in England. For my thesis, I studied three unpublished albums of Heinrich Schliemann with rare photographs from his excavations at Mycenae in 1876. Somewhat fortuitously, Sinclair Hood had bought the albums when he was Director of the British School at Athens in the 1950s. I vividly remember how impressed I was when he came to pick me up from the station in his car, despite his “advanced” years. In the summer of 2009, I once again paid him a visit at his home in Oxfordshire to present a copy of my thesis which I had just supported. And once again he came in his car! On the occasion of this visit I asked him to give me an interview for Aegeus. He accepted my proposal with great pleasure, although Aegeus had been founded only a few months before. Fig. 1. 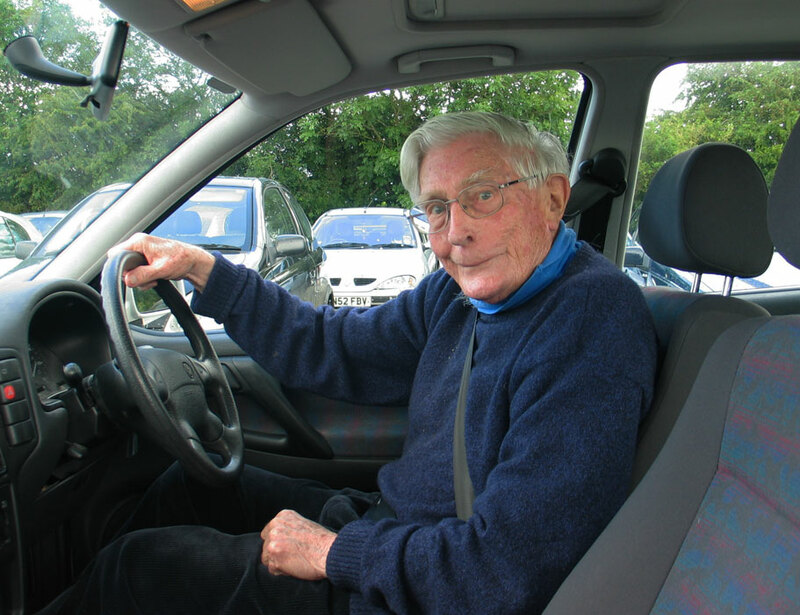 Sinclair Hood in his car (July 2009). The discussion lasted about three hours, and if lunch had not intervened, I imagine it would have lasted all day! So, due to its enormous length, the interview has been divided into two parts. The first part refers to Hood’s formative years as a child, when he decided to become an archaeologist, his first studies and the role that a woman, Kathleen Kenyon, played in his career; the second part, which will be presented very soon, focuses on the period from his arrival in Greece until today. With the launch of the new website of Aegeus, it was high time to present this interview, even though – somewhat regrettably – many years have passed since then. I would like to give special thanks to Duncan Howitt-Marshall, who made the very difficult task of transcribing the interview from the audio recordings, and the archivist of the BSA Amalia Kakissis for providing me some very personal and rare photos of Sinclair Hood, which will be presented in the second part. I would like to cordially thank Sinclair Hood, not only for the honour of granting me this interview, but also for his enthusiastic support of Aegeus. Mr Hood could you tell us a little about your parents? Do you have any siblings? My mother was American and I was an only son . My father was in the Royal Navy but he died when I was two years old, so I have no recollection of him at all. He drowned at sea when his ship sunk just after the First World War. My mother’s sister married another naval officer who had known my father. In fact, he had been his commanding officer at one point. He was a bit older and they only had one son. I think in his case he died in the War, and I think my cousin, Fred, was born after his father’s death. My cousin Fred and I were brought up very much together. He was more or less like a brother when we were young. Anyway, my mother’s sister remarried but my mother never did. Did you grow up here in Oxford? No, in London during the Great Depression of the 1930s , but my mother, in order to save money, bought a bungalow in Cornwall, so we moved there. It was a wonderful place to be a child. I was a young teenager by then. It was lovely. It was in north Cornwall, near the sea and a very good bathing beach. It was not far from a town which had a nice open-air swimming pool filled by the tide each day, which I used to go to a lot. I liked swimming very much. I took to swimming as a sport, as it were. So, I spent most of my childhood there and not in London. It was a wonderful place to have been a child. What else do you remember about your mother? Was she worried about your future career? My mother was very worried, as a good mother should be, that when the Second World War ended I would have no real choice of a career, so she apprenticed me to an architect. At that time I was in the Holborn Stretcher Party at the local barracks, so when I was free, I would cycle down to Chiswick where the architect had his office. He taught me how to measure and draw, which was an enormous help. I mean, I did my own sections for Chios, and I did know how to draw in those days, so it was a great help for my later career. Well, that didn’t last very long. The architect got fed up – it wasn’t a very good arrangement really – and I wasn’t sorry to stop. It was quite a long bike ride and it was a lot of work, but I am very glad she did that. You went to Harrow School  where a number of other men who considerably influenced the history of modern Greece attended, including Lord Byron, Lord Elgin and Arthur Evans. Would you like to say something about that? Yes, you are quite right, but they were there a bit before my time! Well, the funny thing is that one of my direct ancestors had been an exact contemporary of Arthur Evans. Sandy MacGillivray found that out, but he didn’t realise it was an ancestor of mine. He mentions that this particular Hood had founded the school magazine along with Evans . I think he may have been my ancestor who was a priest in our church, the Church of England, but had poor health and used to spend the winters in Egypt. Whilst in Egypt he made a very fine collection of Egyptian antiquities; this was in the ‘good old days’ when there was no fuss or bother about that sort of thing. Among his collection was an edition of The Book of the Dead, but dating from Hellenistic times, so quite late. Anyway, it was quite important, and it was bought by the Metropolitan Museum in New York. The family had wisely sold off the collection after the First World War, which was a good thing because the house where they were kept was destroyed by fire in the 1930s, only a few years after they had sold the collection. So I think it may have been that one who was obviously interested in antiquities in some way, but all of my other ancestors have been very dull. I have only found one mention of any of them and that was in a footnote! Fig. 2. 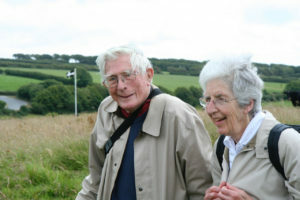 Sinclair and Rachel Hood in Cornwall, UK (July 17, 2008). Photograph by Mary Van Dyke. Were there any other archaeologists in the family? 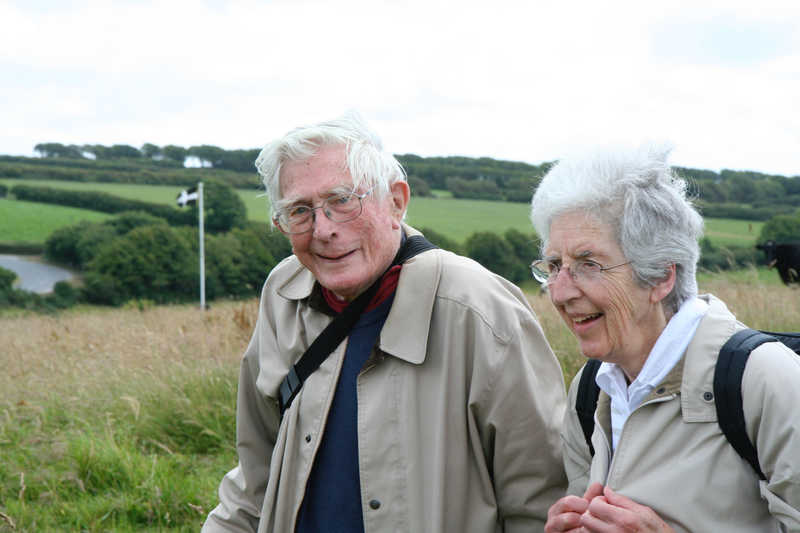 My uncle by marriage – the husband of my father’s sister – was an archaeologist. He was called John Crowfoot and he had been a student of the British School in the first year of the excavations at Phylakopi. His account of excavating at Phylakopi was ludicrous . The School had a condition that they had to excavate on the ancient Greek city as a prelude to working on the prehistoric site, which is what they really wanted to do. But according to his story he was just dumped in the area where the Venus de Milo was found and told to find the arms, which of course he failed to do! That was the way the School did things then. Having said that, Phylakopi was very well excavated by the standards of those days . I liked uncle John very much. He then had a post in Birmingham but decided to join the Civil Service for The Sudan instead, because in those balmy days it was still part of the British Empire. After he retired from The Sudan Civil Service he became the first Director of the British School in Jerusalem, which was founded in the 1930s, before the Second World War . As a child, were you interested in archaeology? When I was at school, I read a book by a popular writer called James Baikie with the exciting title, The Sea-Kings of Crete . That did get me interested. I must have been interested when the Second World War came because I bought – and then it was quite cheap – The Palace of Minos . I am a pacifist, I should tell you, so I was a Conscientious Objector in the War and they put me in Civil Defence in London. When the Germans weren’t bombing London there wasn’t much to do, so one just sat there on duty in case of a bomb coming down or something, and I read the whole of The Palace of Minos. But I hadn’t any particular intention of becoming interested in that alone. This is what I must really do with my life if I survive long enough. I will do archaeology! When did you decide to become an archaeologist? I had a friend – I lost track of him later – who was an architect by profession and, like me, was a Conscientious Objector during the War. We got on very well together. He opened my eyes to the glories of Victorian architecture, which I had always despised like most people until then. He asked me one weekend when I was off-duty to stay with the family of the girl he later married. During my stay I went off for a walk and visited a long barrow, a big Neolithic barrow tomb, and it was very romantic – a sort of wooded place. It had a door, a modern door of course, and a very old lady in the nearby cottage gave me the key and a candle. When I went in to it I was so excited. I thought, “This is what I must really do with my life if I survive long enough. I will do archaeology!” – but at that stage I hadn’t thought about Crete. I had some friends who had a cottage up on the Roden Down in Berkshire, at a place called Compton. It was out in the fields, very remote. I stayed with them and I saw some very interesting-looking small earthworks. I thought, “Wouldn’t it be nice to excavate them”. The wife of their neighbour had worked before the war on excavations with Kathleen Kenyon at Wroxeter, a Roman site somewhere in the Midlands . Anyway, she and I got together and started excavating it. We waited until the war was over, but Kathleen Kenyon came down to have a look . Fig. 3. 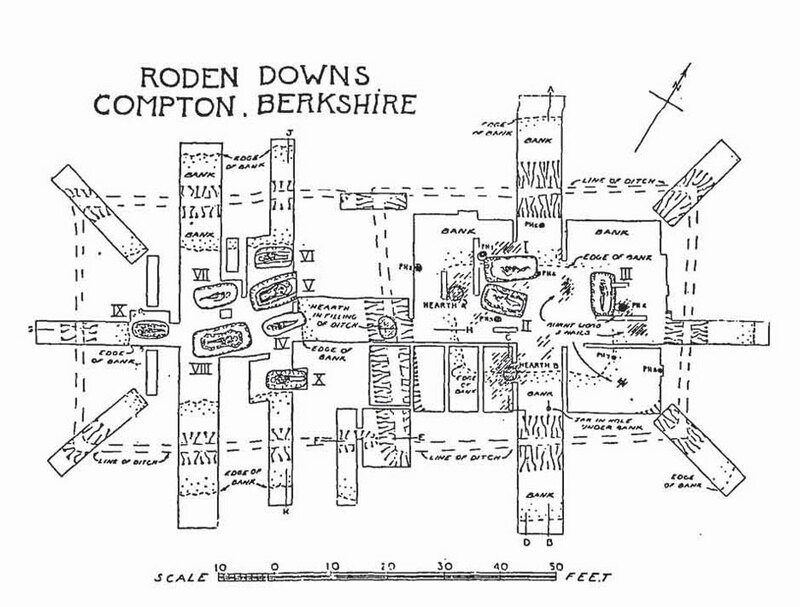 The Roden Downs cemetery, excavated by Hood and Walton in 1945-1946. After S. Hood & H. Walton, A Romano-British cremating place and burial ground on Roden Downs, Compton, Berks, Transactions of the Newbury District Field Club 9 (1) (1948), 1-62. We found two little enclosures side by side. They formed part of a very Late Roman burial ground – quite important burials; one of them in a lead coffin and one of them with a group of very Late Roman coins. That was quite interesting and Kathleen Kenyon told us who to contact for the study of the skeletons and all that sort of thing . Then she took me more-or-less by the ‘scuff of the neck’ and said, “You come as soon as you are released from the Civil Defence and do a Diploma under me at London University” – a Diploma in Archaeology, which I did. So you studied Archaeology at University College London? Yes, that’s right. I had the very good fortune to start my work on the Diploma under Kenyon but then Gordon Childe was appointed and he was a wonderful person, I must say . I was deeply attached to him as were all his other students. He was really something quite phenomenal. Anyway, when I had my viva , which I didn’t do too well in, Childe said, “I have a job for you”, and by strange coincidence it was a job at Birmingham, where my uncle John had been. It was under the Assistant Professor there, who was a very great friend of Childe, a very nice man. I met him later in life and we discussed what it would have been like if I had taken the job. But Kathleen Kenyon said, “No, you’re going as a student to Athens”, instead. I was really, almost, sent to Greece in order to teach the British School the methods of excavation that had been developed by Sir Mortimer Wheeler here in England. Is that why you came to Greece? That’s how it happened. Kathleen Kenyon wanted me to go! Having read Evans in the Second World War, I had a basic interest. Otherwise, I would have gone to Birmingham and got immersed in British Archaeology, which would have interested me very much. I had no specialised interest in Crete at that time. In those days the British School at Athens was not regarded with favour from the point of view of its methods of excavating by people like Wheeler or Kenyon. She was very anxious to put them on the ‘right track’, as it were. I was really, almost, sent to Greece in order to teach the British School the methods of excavation that had been developed by Sir Mortimer Wheeler here in England . Anyway, it seemed to me I was free to do whatever I pleased. I had no commitments here in England. My mother went to America after the Second World War, and my father had died when I was two. What else do you remember about Kathleen Kenyon? Fig. 4. Kathleen Kenyon in the 1950s. She was a very forceful woman. Something that I didn’t know then was that she had in fact taught my uncle John how to excavate. She had been his assistant in Jerusalem and told him how to do things properly! She was trained by Wheeler. She was head of St Hugh’s College at Oxford when I last saw her. She died many years ago . I should say that when I was doing my Diploma in London she was also running an excavation of a Roman settlement at Southwark, on the other side of the Thames where Shakespeare’s Globe was. She made me go and help with that – it was an evening thing, done with students like myself. She was a good teacher and, as part of the Diploma, she taught me how to use a level and how to draw. For the second part click here. 1. Sinclair Hood was born in 1917. His mother’s name was Frances (nee Winants), and his father’s name was Martin Hood (see D. Evely, H. Hughes-Brock & N. Momigliano (eds), Knossos. A Labyrinth of History. Papers Presented in Honour of Sinclair Hood, Oxford 1994). 2. The Great Depression was an economic decline that affected North America and most of Europe. It started with the Wall Street Crash of 1929, and lasted until the late 1930s. 3. Harrow School is a boarding school for boys, founded in 1572. It is situated outside London. 4. The name of the magazine was The Harrovian. See J.A. MacGillivray, Minotaur. Sir Arthur Evans and the Archaeology of the Minoan Myth, London (2000), p. 35. 5. On John Winter Crowfoot (1873-1959) see the article on the website of the Palestine Exploration Fund. 6. The first excavations at Phylakopi were conducted between the years 1896 and 1899. The results were published as: T.D. Atkinson, R.C. Bosanquet, C.C. Edgar, A.J. Evans, D.G. Hogarth, D. Mackenzie, C. Smith, & F.B. Welch, Excavations at Phylakopi in Melos conducted by the British School at Athens, London (1904). Online edition. 7. Actually, the British School of Archaeology in Jerusalem (BSAJ) was established in 1919. The first Director was John Garstang. Crowfoot succeeded John Garstang after the latter’s resignation in 1926. 8. First published in 1910, with a new augmented edition in 1926. Most likely, Hood read this new augmented edition. The first edition is available online. 9. All volumes of the Palace of Minos are available online. 10. Kathleen Kenyon excavated at Wroxeter in 1936-1937. 11. Hood excavated with Hilary Walton in 1945-1946. The results were published in 1948 as S. Hood and H. Walton, A Romano-British cremating place and burial ground on Roden Downs, Compton, Berks, Transactions of the Newbury District Field Club 9 (1) (1948), 1-62. 12. The skeletons were published by Frank Colyer in 1947. See his article ‘Note on Ten Romano-British Skulls from a Burial Ground at Compton, Berkshire’, Proceedings of the Royal Society of Medicine, Nov 1947, No. 40 (13), pp. 837–840. 13. Undoubtedly Gordon Childe was one of the most influential archaeologists of the 20th century. On Vere Gordon Childe (1892-1957) see Jim Allen’s article published in the Australian Dictionary of Biography, Volume 7, (MUP), 1979, also published online. 14. He received his Diploma of Archaeology in 1947. 15. Mortimer Wheeler’s excavating methods were refined by Kathleen Kenyon. Their technique is known as Wheeler-Kenyon method or even better “the grid method”. For a short history of excavating methods see the article of E. Higginbotham, Excavation techniques in Historical Archaeology, Australian Historical Archaeology 1985, 8-14 (online). 16. 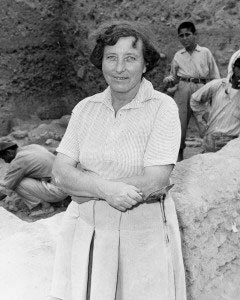 Dame Kathleen Mary Kenyon (1906-1978) is arguably the most influential woman archaeologist of the 20th century. On Kenyon see M.C. Davis, Dame Kathleen Kenyon, Digging up the Holy Land, Walnut Creek (2008). See, also, the online biography by Michael McKinney.